Both community-associated and hospital-acquired infections with Staphylococcus aureus have increased in the past 20 years, and the rise in incidence has been accompanied by a rise in antibiotic-resistant strains—in particular, methicillin-resistant S aureus (MRSA) and, more recently, vancomycin-resistant strains. An example of radiographic findings in S aureus infections is shown in the image below. 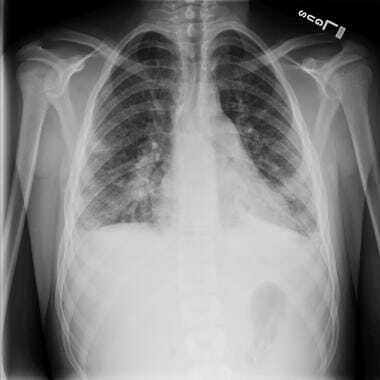 Posteroanterior chest radiograph of a 15-year-old with staphylococcal endocarditis and multiple septic emboli, revealing borderline cardiomegaly, multiple nodular infiltrates, and bilateral pleural effusions. Bacteria of the genus Staphylococcus are gram-positive cocci that are microscopically observed as individual organisms, in pairs, and in irregular, grapelike clusters. The term Staphylococcus is derived from the Greek term staphyle, meaning "a bunch of grapes." Staphylococci are nonmotile, non–spore-forming, and catalase-positive bacteria. The cell wall contains peptidoglycan and teichoic acid. The organisms are resistant to temperatures as high as 50°C, to high salt concentrations, and to drying. Colonies are usually large (6-8 mm in diameter), smooth, and translucent. The colonies of most strains are pigmented, ranging from cream-yellow to orange. The ability to clot plasma continues to be the most widely used and generally accepted criterion for the identification of Staphylococcus aureus. One such factor, bound coagulase, also known as clumping factor, reacts with fibrinogen to cause organisms to aggregate. Another factor, extracellular staphylocoagulase, reacts with prothrombin to form staphylothrombin, which can convert fibrinogen to fibrin. Approximately 97% of human S aureus isolates possess both of these forms of coagulase. The organism may cause disease through tissue invasion and toxin production. The toxins liberated by the organism may have effects at sites distant from the focus of infection or colonization. The postulated sequence of events that leads to infection is initiated with carriage of the organism. The organism is then disseminated via hand carriage to body sites where infection may occur (either through overt breaks in dermal surfaces, such as vascular catheterization or operative incisions, or through less evident breakdown in barrier function, such as eczema or shaving-associated microtrauma). The hallmark of staphylococcal infection is the abscess, which consists of a fibrin wall surrounded by inflamed tissues enclosing a central core of pus containing organisms and leukocytes. From this focus of infection, the organisms may be disseminated hematogenously, even from the smallest abscess. The ability to elaborate proteolytic enzymes facilitates the process. This may result in pneumonia, bone and joint infection, and infection of the heart valves. In immunocompromised hosts (eg, patients with cancer who are neutropenic and have a central venous line), 20-30% develop serious complications or fatal sepsis following catheter-related S aureus bacteremia. Persistent deep-seated infections have now been linked to small-colony variants of the organism. This population is more resistant to antibiotics and grows slowly. These organisms have been described in patients with cystic fibrosis and may contribute to the persistence of S aureus in these patients. The organism also elaborates toxins that can cause specific diseases or syndromes and likely participate in the pathogenesis of staphylococcal infection. Enterotoxin-producing strains of S aureus cause one of the most common food-borne illnesses. The most common presentation is acute onset of vomiting and watery diarrhea 2-6 hours after ingestion. The symptoms are usually self-limited. The cause is the proliferation of toxin-producing organisms in uncooked or partially cooked food that an individual carrying the staphylococci has contaminated. The most feared manifestation of S aureus toxin production is toxic shock syndrome (TSS). Although first described in children, it was most frequently associated with women using tampons during menstruation. Since the early 1990s, at least half of the cases have not been associated with menstruation. The syndrome is associated with strains that produce the exotoxin TSST-1, but strains that produce enterotoxins B and C may cause 50% of cases of nonmenstrual TSS. These toxins are superantigens, T-cell mitogens that bind directly to invariant regions of major histocompatibility complex class II molecules, causing an expansion of clonal T cells, followed by a massive release of cytokines. This cytokine release mediates the TSS; the resultant pathophysiology mimics that of endotoxic shock. In a worldwide trend,  the proportion of infections caused by CA-MRSA has increased. Initially noted in tertiary care centers, these infections are now increasingly common in the community. [38, 39] Resistance to methicillin confers resistance to all penicillinase-resistant penicillins and cephalosporins. This high level of resistance requires the mec gene that encodes penicillin-binding protein 2a. This protein has decreased binding affinity for most penicillins and cephalosporins. Methicillin resistance has a wide variety of phenotypic expression. Heterogeneous resistance, recognized in the first clinical isolates described, is the typical phenotype. In this case, all cells carry the genetic markers of resistance but only a small fraction of them express the phenotype. Homogenous resistance is less frequent, with a single population of cells that are inhibited only through high concentrations of antibiotics. Methicillin-resistant S aureus (MRSA) was initially described in hospitalized populations. University affiliation and greater number of beds were institutional risk factors. In pediatric centers, number of beds, region, and metropolitan population correlated with increased risk. Numbers of both community-associated and hospital-acquired infections have increased in the past 20 years. From 1990-1992, data from the National Nosocomial Infections Surveillance System for the Centers for Disease Control and Prevention (CDC) revealed that S aureus was the most common cause of nosocomial pneumonia and operative wound infections and the second most common cause of nosocomial bloodstream infections. An analysis of 148 consecutive patients with acute musculoskeletal S aureus infection (111 with MSSA and 37 with MRSA) found that the proportion of pediatric MRSA infections increased from 11.8% to 34.8% between 2001 and 2009, resulting in longer mean hospitalizations (13 vs 8 days).  . In addition, children with MRSA infection more often required surgical procedures (38% vs. 15%), experienced more infection-related complications (24% vs 6%), and were more often admitted to the intensive care unit (16% vs 3%). Morbidity and mortality from S aureus infection widely varies depending on the clinical entity. Although mortality is low in children with scalded skin syndrome, most fatalities are associated with delay in diagnosis. The male-to-female ratio of skeletal infections is 2:1, mostly because boys are more likely to experience traumatic events. Jamal N, Teach SJ. Necrotizing fasciitis. Pediatr Emerg Care. 2011 Dec. 27(12):1195-9; quiz 1200-2. [Medline]. Jaramillo D. Infection: musculoskeletal. Pediatr Radiol. 2011 May. 41 Suppl 1:S127-34. [Medline]. Chou H, Teo HE, Dubey N, Peh WC. Tropical pyomyositis and necrotizing fasciitis. Semin Musculoskelet Radiol. 2011 Nov. 15(5):489-505. [Medline]. Lane JW, Tang J, Taggard D, Byun R. Successful use of daptomycin and linezolid, without surgical intervention, in the treatment of extensive epidural abscess and bacteremia due to methicillin-resistant Staphylococcus aureus (MRSA). Infect Dis Clin Pract. Sept 2011. 19(5):362-364. Abdel-Haq N, Quezada M, Asmar BI. Retropharyngeal Abscess in Children: The Rising Incidence of Methicillin-Resistant Staphylococcus aureus. Pediatr Infect Dis J. 2012 Jul. 31(7):696-9. [Medline]. McNeil JC, Hulten KG, Kaplan SL, Mahoney DH, Mason EO. Staphylococcus aureus Infections in Pediatric Oncology Patients: High Rates of Antimicrobial Resistance, Antiseptic Tolerance and Complications. Pediatr Infect Dis J. 2012 Sep 11. [Medline]. Elliott DJ, Zaoutis TE, Troxel AB, Loh A, Keren R. Empiric Antimicrobial Therapy for Pediatric Skin and Soft-Tissue Infections in the Era of Methicillin-Resistant Staphylococcus aureus. Pediatrics. 2009 Jun. 123(6):e959-66. [Medline]. Lee S, Choe PG, Song KH, Park SW, Kim HB, Kim NJ, et al. Is cefazolin inferior to nafcillin for treatment of methicillin-susceptible Staphylococcus aureus bacteremia?. Antimicrob Agents Chemother. 2011 Nov. 55(11):5122-6. [Medline]. [Full Text]. Williams DJ, Cooper WO, Kaltenbach LA, Dudley JA, Kirschke DL, Jones TF, et al. Comparative Effectiveness of Antibiotic Treatment Strategies for Pediatric Skin and Soft-Tissue Infections. Pediatrics. 2011 Aug 15. [Medline]. [Guideline] Liu C, Bayer A, Cosgrove SE, et al. Clinical Practice Guidelines by the Infectious Diseases Society of America for the Treatment of Methicillin-Resistant Staphylococcus Aureus Infections in Adults and Children. Clin Infect Dis. 2011 Feb 1. 52(3):e18-e55. [Medline]. Kemper AR, Dolor RJ, Fowler VG Jr. Management of skin abscesses by primary care pediatricians. Clin Pediatr (Phila). 2011 Jun. 50(6):525-8. [Medline]. Sreeramoju P, Porbandarwalla NS, Arango J, Latham K, Dent DL, Stewart RM, et al. Recurrent skin and soft tissue infections due to methicillin-resistant Staphylococcus aureus requiring operative debridement. Am J Surg. 2011 Feb. 201(2):216-20. [Medline]. Pääkkönen M, Kallio PE, Kallio MJ, Peltola H. Management of Osteoarticular Infections Caused by Staphylococcus aureus Is Similar to That of Other Etiologies: Analysis of 199 Staphylococcal Bone and Joint Infections. Pediatr Infect Dis J. 2012 May. 31(5):436-8. [Medline]. Boggs W. Daptomycin Treats S. aureus Bacteremia Without Nephrotoxicity. Medscape Medical News. January 8, 2013. Available at http://www.medscape.com/viewarticle/777276. Accessed: January 15, 2013.
von Eiff C, Becker K, Machka K, Stammer H, Peters G. Nasal carriage as a source of Staphylococcus aureus bacteremia. Study Group. N Engl J Med. 2001 Jan 4. 344(1):11-6. [Medline]. van Belkum A, Verkaik NJ, de Vogel CP, Boelens HA, Verveer J, Nouwen JL. Reclassification of Staphylococcus aureus Nasal Carriage Types. J Infect Dis. 2009 Jun 15. 199(12):1820-6. [Medline]. Wenzel RP, Perl TM. The significance of nasal carriage of Staphylococcus aureus and the incidence of postoperative wound infection. J Hosp Infect. 1995 Sep. 31(1):13-24. [Medline]. Ruimy R, Angebault C, Djossou F, et al. Are host genetics the predominant determinant of persistent nasal Staphylococcus aureus carriage in humans?. J Infect Dis. 2010 Sep 15. 202(6):924-34. [Medline]. Chen CJ, Hsu KH, Lin TY, Hwang KP, Chen PY, Huang YC. Factors associated with nasal colonization of methicillin-resistant Staphylococcus aureus among healthy children in Taiwan. J Clin Microbiol. 2011 Jan. 49(1):131-7. [Medline]. [Full Text]. Nerby JM, Gorwitz R, Lesher L, Juni B, Jawahir S, Lynfield R. Risk Factors for Household Transmission of Community-associated Methicillin-resistant Staphylococcus aureus. Pediatr Infect Dis J. 2011 Nov. 30(11):927-32. [Medline]. Fritz SA, Krauss MJ, Epplin EK, Burnham CA, Garbutt J, Dunne WM, et al. The natural history of contemporary Staphylococcus aureus nasal colonization in community children. Pediatr Infect Dis J. 2011 Apr. 30(4):349-51. [Medline]. [Full Text]. Gesualdo F, Bongiorno D, Rizzo C, Bella A, Menichella D, Stefani S, et al. MRSA Nasal Colonization in Children: Prevalence Meta-Analysis, Review of Risk Factors and Molecular Genetics. Pediatr Infect Dis J. 2013 Jan 21. [Medline]. Peters PJ, Brooks JT, McAllister SK, Limbago V, Lowery HK, Fosheim G, et al. Methicillin-resistant Staphylococcus aureus colonization of the groin and risk for clinical infection among HIV-infected adults. Emerg Infect Dis. April 2013. 19(4):623-629. Faden H, Lesse AJ, Trask J, Hill JA, Hess DJ, Dryja D. Importance of Colonization Site in the Current Epidemic of Staphylococcal Skin Abscesses. Pediatrics. 2010 Feb 15. [Medline]. Lee CJ, Sankaran S, Mukherjee DV, Apa ZL, Hafer CA, Wright L. Staphylococcus aureus oropharyngeal carriage in a prison population. Clin Infect Dis. 2011 Mar 15. 52(6):775-8. [Medline]. Nowrouzian FL, Dauwalder O, Meugnier H, Bes M, Etienne J, Vandenesch F, et al. Adhesin and Superantigen Genes and the Capacity of Staphylococcus aureus to Colonize the Infantile Gut. J Infect Dis. 2011 Sep. 204(5):714-21. [Medline]. Milstone AM, Song X, Coffin S, Elward A. Identification and eradication of methicillin-resistant Staphylococcus aureus colonization in the neonatal intensive care unit: results of a national survey. Infect Control Hosp Epidemiol. 2010 Jul. 31(7):766-8. [Medline]. [Full Text]. Nakamura MM, McAdam AJ, Sandora TJ, Moreira KR, Lee GM. Higher prevalence of pharyngeal than nasal Staphylococcus aureus carriage in pediatric intensive care units. J Clin Microbiol. 2010 Aug. 48(8):2957-9. [Medline]. Matheson EM, Mainous AG 3rd, Everett CJ, King DE. Tea and coffee consumption and MRSA nasal carriage. Ann Fam Med. 2011 Jul-Aug. 9(4):299-304. [Medline]. Zanger P, Nurjadi D, Gaile M, Gabrysch S, Kremsner PG. Hormonal Contraceptive Use and Persistent Staphylococcus aureus Nasal Carriage. Clin Infect Dis. 2012 Dec. 55(12):1625-32. [Medline]. Bartlett AH, Hulten KG. Staphylococcus aureus pathogenesis: secretion systems, adhesins, and invasins. Pediatr Infect Dis J. 2010 Sep. 29(9):860-1. [Medline]. Tuchscherr L, Heitmann V, Hussain M, Viemann D, Roth J, von Eiff C, et al. Staphylococcus aureus small-colony variants are adapted phenotypes for intracellular persistence. J Infect Dis. 2010 Oct 1. 202(7):1031-40. [Medline]. Verkaik NJ, Dauwalder O, Antri K, Boubekri I, de Vogel CP, Badiou C. Immunogenicity of toxins during Staphylococcus aureus infection. Clin Infect Dis. 2010 Jan 1. 50(1):61-8. [Medline]. Aalfs AS, Oktarina DA, Diercks GF, Jonkman MF, Pas HH. Staphylococcal scalded skin syndrome: loss of desmoglein 1 in patient skin. Eur J Dermatol. 2010 Jul-Aug. 20(4):451-6. [Medline]. Bassetti M, Nicco E, Mikulska M. Why is community-associated MRSA spreading across the world and how will it change clinical practice?. Int J Antimicrob Agents. 2009 Jul. 34 Suppl 1:S15-9. [Medline]. David MZ, Daum RS. Community-associated methicillin-resistant Staphylococcus aureus: epidemiology and clinical consequences of an emerging epidemic. Clin Microbiol Rev. 2010 Jul. 23(3):616-87. [Medline]. Pickett A, Wilkinson M, Menoch M, Snell J, Yniguez R, Bulloch B. Changing incidence of methicillin-resistant staphylococcus aureus skin abscesses in a pediatric emergency department. Pediatr Emerg Care. 2009 Dec. 25(12):831-4. [Medline]. Kairam N, Silverman ME, Salo DF, Baorto E, Lee B, Amato CS. Cutaneous Methicillin-Resistant Staphylococcus aureus in a Suburban Community Hospital Pediatric Emergency Department. J Emerg Med. 2011 Nov. 41(5):460-5. [Medline]. Boucher HW, Corey GR. Epidemiology of methicillin-resistant Staphylococcus aureus. Clin Infect Dis. 2008 Jun 1. 46 Suppl 5:S344-9. [Medline]. Tenover FC, Goering RV. Methicillin-resistant Staphylococcus aureus strain USA300: origin and epidemiology. J Antimicrob Chemother. 2009 Sep. 64(3):441-6. [Medline]. Talan DA, Krishnadasan A, Gorwitz RJ, Fosheim GE, Limbago B, Albrecht V, et al. Comparison of Staphylococcus aureus From Skin and Soft-Tissue Infections in US Emergency Department Patients, 2004 and 2008. Clin Infect Dis. 2011 Jul. 53(2):144-149. [Medline]. Long CB, Madan RP, Herold BC. Diagnosis and management of community-associated MRSA infections in children. Expert Rev Anti Infect Ther. 2010 Feb. 8(2):183-95. [Medline]. Lowy FD. How Staphylococcus aureus adapts to its host. N Engl J Med. 2011 May 26. 364(21):1987-90. [Medline]. Hay R, Noor NM. Panton-Valentine leucocidin and severe Staphylococcus aureus infections of the skin: sole culprit or does it have accomplices?. Curr Opin Infect Dis. 2011 Apr. 24(2):97-9. [Medline]. Ritz N, Curtis N. The Role of Panton-Valentine Leukocidin in Staphylococcus aureus Musculoskeletal Infections in Children. Pediatr Infect Dis J. 2012 May. 31(5):514-8. [Medline]. Mendes RE, Deshpande LM, Smyth DS, Shopsin B, Farrell DJ, Jones RN. Characterization of methicillin-resistant Staphylococcus aureus strains recovered from a phase IV clinical trial for linezolid versus vancomycin for treatment of nosocomial pneumonia. J Clin Microbiol. 2012 Nov. 50(11):3694-702. [Medline]. [Full Text]. Hermos CR, Yoong P, Pier GB. High levels of antibody to panton-valentine leukocidin are not associated with resistance to Staphylococcus aureus-associated skin and soft-tissue infection. Clin Infect Dis. 2010 Nov 15. 51(10):1138-46. [Medline]. Grundmeier M, Tuchscherr L, Bruck M, Viemann D, Roth J, Willscher E. Staphylococcal strains vary greatly in their ability to induce an inflammatory response in endothelial cells. J Infect Dis. 2010 Mar 15. 201(6):871-80. [Medline]. Strandberg KL, Rotschafer JH, Vetter SM, Buonpane RA, Kranz DM, Schlievert PM. Staphylococcal superantigens cause lethal pulmonary disease in rabbits. J Infect Dis. 2010 Dec 1. 202(11):1690-7. [Medline]. Li M, Cheung GY, Hu J, Wang D, Joo HS, Deleo FR, et al. Comparative analysis of virulence and toxin expression of global community-associated methicillin-resistant Staphylococcus aureus strains. J Infect Dis. 2010 Dec 15. 202(12):1866-76. [Medline]. Torres VJ, Stauff DL, Pishchany G, Bezbradica JS, Gordy LE, Iturregui J, et al. A Staphylococcus aureus regulatory system that responds to host heme and modulates virulence. Cell Host Microbe. 2007 Apr 19. 1(2):109-19. [Medline]. [Full Text]. Pishchany G, McCoy AL, Torres VJ, Krause JC, Crowe JE Jr, Fabry ME, et al. Specificity for human hemoglobin enhances Staphylococcus aureus infection. Cell Host Microbe. 2010 Dec 16. 8(6):544-50. [Medline]. [Full Text]. Kobayashi SD, Malachowa N, Whitney AR, Braughton KR, Gardner DJ, Long D, et al. Comparative Analysis of USA300 Virulence Determinants in a Rabbit Model of Skin and Soft Tissue Infection. J Infect Dis. 2011 Sep. 204(6):937-41. [Medline]. [Full Text]. Hota B, Lyles R, Rim J, Popovich KJ, Rice T, Aroutcheva A. Predictors of clinical virulence in community-onset methicillin-resistant Staphylococcus aureus infections: the importance of USA300 and pneumonia. Clin Infect Dis. 2011 Oct. 53(8):757-65. [Medline]. Peyrani P, Allen M, Wiemken TL, Haque NZ, Zervos MJ, Ford KD, et al. Severity of disease and clinical outcomes in patients with hospital-acquired pneumonia due to methicillin-resistant Staphylococcus aureus strains not influenced by the presence of the Panton-Valentine Leukocidin gene. Clin Infect Dis. 2011 Oct. 53(8):766-71. [Medline]. Kebaier C, Chamberland RR, Allen IC, Gao X, Broglie PM, Hall JD. Staphylococcus aureus a-Hemolysin Mediates Virulence in a Murine Model of Severe Pneumonia Through Activation of the NLRP3 Inflammasome. J Infect Dis. 2012 Mar. 205(5):807-17. [Medline]. Rudkin JK, Edwards AM, Bowden MG, Brown EL, Pozzi C, Waters EM. Methicillin Resistance Reduces the Virulence of Healthcare-Associated Methicillin-Resistant Staphylococcus aureus by Interfering With the agr Quorum Sensing System. J Infect Dis. 2012 Mar. 205(5):798-806. [Medline]. Sharma-Kuinkel BK, Ahn SH, Rude TH, Zhang Y, Tong SY, Ruffin F, et al. Presence of genes encoding panton-valentine leukocidin is not the primary determinant of outcome in patients with hospital-acquired pneumonia due to Staphylococcus aureus. J Clin Microbiol. 2012 Mar. 50(3):848-56. [Medline]. [Full Text]. Soong G, Chun J, Parker D, Prince A. Staphylococcus aureus Activation of Caspase 1/Calpain Signaling Mediates Invasion Through Human Keratinocytes. J Infect Dis. 2012 May. 205(10):1571-9. [Medline]. Otto M. How Staphylococcus aureus Breaches Our Skin to Cause Infection. J Infect Dis. 2012 May. 205(10):1483-5. [Medline]. Wehrhahn MC, Robinson JO, Pascoe EM, Coombs GW, Pearson JC, O'Brien FG. Illness Severity in Community-Onset Invasive Staphylococcus aureus Infection and the Presence of Virulence Genes. J Infect Dis. 2012 Jun. 205(12):1840-8. [Medline]. Garofalo A, Giai C, Lattar S, Gardella N, Mollerach M, Kahl BC. The Length of the Staphylococcus aureus Protein A Polymorphic Region Regulates Inflammation: Impact on Acute and Chronic Infection. J Infect Dis. 2012 Jul. 206(1):81-90. [Medline]. Shallcross LJ, Fragaszy E, Johnson AM, Hayward AC. The role of the Panton-Valentine leucocidin toxin in staphylococcal disease: a systematic review and meta-analysis. Lancet Infect Dis. 2013 Jan. 13(1):43-54. [Medline]. [Full Text]. Suryadevara M, Clark AE, Wolk DM, Carman A, Rosenbaum PF. Molecular characterization of invasive Staphylococcus aureus infection in central New York children: importance of two clonal groups and inconsistent presence of selected virulence determinants. J Pediatr Infect Dis Soc. March 2013. 2(1):30-39. Schneider-Lindner V, Quach C, Hanley JA, Suissa S. Antibacterial Drugs and the Risk of Community-Associated Methicillin-Resistant Staphylococcus aureus in Children. Arch Pediatr Adolesc Med. 2011 Aug 1. [Medline]. Smith TL, Pearson ML, Wilcox KR, et al. Emergence of vancomycin resistance in Staphylococcus aureus. Glycopeptide-Intermediate Staphylococcus aureus Working Group. N Engl J Med. 1999 Feb 18. 340(7):493-501. [Medline]. Zheng X, Qi C, Arrieta M, O'Leary A, Wang D, Shulman ST. Lack of increase in vancomycin resistance of pediatric methicillin-resistant Staphylococcus aureus Isolates from 2000 to 2007. Pediatr Infect Dis J. 2010 Sep. 29(9):882-4. [Medline]. Cameron DR, Ward DV, Kostoulias X, Howden BP, Moellering RC Jr, Eliopoulos GM. Serine/Threonine Phosphatase Stp1 Contributes to Reduced Susceptibility to Vancomycin and Virulence in Staphylococcus aureus. J Infect Dis. 2012 Jun. 205(11):1677-87. [Medline]. Cheung A, Duclos B. Stp1 and Stk1: The Yin and Yang of Vancomycin Sensitivity and Virulence in Vancomycin-Intermediate Staphylococcus aureus Strains. J Infect Dis. 2012 Jun. 205(11):1625-7. [Medline]. Shore AC, Deasy EC, Slickers P, et al. Detection of Staphylococcal Cassette Chromosome mec Type XI Encoding Highly Divergent mecA, mecI, mecR1, blaZ and ccr Genes in Human Clinical Clonal Complex 130 Methicillin-Resistant Staphylococcus aureus. Antimicrob Agents Chemother. 2011 Jun 2. [Medline]. García-Álvarez L, Holden MT, Lindsay H, et al. Meticillin-resistant Staphylococcus aureus with a novel mecA homologue in human and bovine populations in the UK and Denmark: a descriptive study. Lancet Infect Dis. 2011 Jun 2. [Medline]. Cameron DR, Howden BP, Peleg AY. The interface between antibiotic resistance and virulence in Staphylococcus aureus and its impact upon clinical outcomes. Clin Infect Dis. 2011 Sep. 53(6):576-82. [Medline]. [Guideline] CDC. Interim guidelines for prevention and control of Staphylococcal infection associated with reduced susceptibility to vancomycin. MMWR Morb Mortal Wkly Rep. 1997 Jul 11. 46(27):626-8, 635. [Medline]. Iwamoto M, Mu Y, Lynfield R, Bulens SN, Nadle J, Aragon D, et al. Trends in Invasive Methicillin-Resistant Staphylococcus aureus Infections. Pediatrics. 2013 Oct. 132(4):e817-e824. [Medline]. Laidman J. Community-Associated MRSA Incidence on the Rise in Children. Medscape [serial online]. Available at http://www.medscape.com/viewarticle/811483. Accessed: September 30, 2013. Helwick C. MRSA Rising in Children With Musculoskeletal Infections. Medscape [serial online]. Available at http://www.medscape.com/viewarticle/813484. Accessed: November 4, 2013. Saravolatz LD, Pawlak J, Johnson LB. In vitro susceptibilities and molecular analysis of vancomycin-intermediate and vancomycin-resistant Staphylococcus aureus isolates. Clin Infect Dis. 2012 Aug. 55(4):582-6. [Medline]. Frei CR, Makos BR, Daniels KR, Oramasionwu CU. Emergence of community-acquired methicillin-resistant Staphylococcus aureus skin and soft tissue infections as a common cause of hospitalization in United States children. J Pediatr Surg. 2010 Oct. 45(10):1967-74. [Medline]. Hadler JL, Petit S, Mandour M, Cartter ML. Trends in Invasive Infection with Methicillin-Resistant Staphylococcus aureus, Connecticut, USA, 2001-2010. Emerg Infect Dis. 2012 Jun. 18(6):917-24. [Medline]. [Full Text]. Suryadevara M, Moro MR, Rosenbaum PF, Kiska D, Riddell S, Weiner LB. Incidence of invasive community-onset Staphylococcus aureus infections in children in Central New York. J Pediatr. 2010 Jan. 156(1):152-154.e1. [Medline]. Landrum ML, Neumann C, Cook C, Chukwuma U, Ellis MW, Hospenthal DR. Epidemiology of Staphylococcus aureus Blood and Skin and Soft Tissue Infections in the US Military Health System, 2005-2010Staphylococcus aureus in US Military. JAMA. 2012 Jul 4. 308(1):50-9. [Medline]. Hsiang MS, Shiau R, Nadle J, Chan L, Lee B, Chambers HF, et al. Epidemiologic similarities in pediatric community-associated methicillin-resistant and methicillin-sensitive Staphylococcus aureus in the San Francisco Bay area. J Pediatr Infect Dis Soc. September 2012. 1(3):200-211. Reyes J, Rincon S, Diaz L, et al. Dissemination of methicillin-resistant Staphylococcus aureus USA300 sequence type 8 lineage in Latin America. Clin Infect Dis. 2009 Dec 15. 49(12):1861-7. [Medline]. [Full Text]. Sutter DE, Milburn E, Chukwuma U, Dzialowy N, Maranich AM, Hospenthal DR. Changing Susceptibility of Staphylococcus aureus in a US Pediatric Population. Pediatrics. 2016 Mar 1. [Medline]. Smit J, Søgaard M, Schønheyder HC, Nielsen H, Frøslev T, Thomsen RW. Diabetes and risk of community-acquired Staphylococcus aureus bacteremia: A population-based case-control study. Eur J Endocrinol. 2016 Mar 10. [Medline]. Davenport L. Diabetes Patients at Higher Risk of S aureus Blood Infection. Medscape Medical News. Available at http://www.medscape.com/viewarticle/860376. March 15, 2016; Accessed: April 27, 2016. Saxena S, Thompson P, Birger R, Bottle A, Spyridis N, Wong I. Increasing Skin Infections and Staphylococcus aureus Complications in Children, England, 1997-2006. Emerg Infect Dis. 2010 Mar. 16(3):530-533. [Medline]. Otter JA, French GL. Molecular epidemiology of community-associated meticillin-resistant Staphylococcus aureus in Europe. Lancet Infect Dis. 2010 Apr. 10(4):227-239. [Medline]. Lessa FC, Mu Y, Davies J, Murray M, Lillie M, Pearson A. Comparison of incidence of bloodstream infection with methicillin-resistant Staphylococcus aureus between England and United States, 2006-2007. Clin Infect Dis. 2010 Oct 15. 51(8):925-8. [Medline]. Golding GR, Levett PN, McDonald RR, Irvine J, Quinn B, Nsungu M. High rates of Staphylococcus aureus USA400 infection, Northern Canada. Emerg Infect Dis. 2011 Apr. 17(4):722-5. [Medline]. Golding GR, Levett PN, McDonald RR, Irvine J, Nsungu M, Woods S, et al. A comparison of risk factors associated with community-associated methicillin-resistant and -susceptible Staphylococcus aureus infections in remote communities. Epidemiol Infect. 2010 May. 138(5):730-7. [Medline]. Kim J, Ferrato C, Golding GR, Mulvey MR, Simmonds KA, Svenson LW, et al. Changing epidemiology of methicillin-resistant Staphylococcus aureus in Alberta, Canada: population-based surveillance, 2005-2008. Epidemiol Infect. 2010 Sep 21. 1-10. [Medline]. Matlow A, Forgie S, Pelude L, Embree J, Gravel D, Langley JM, et al. National surveillance of methicillin-resistant Staphylococcus aureus among hospitalized pediatric patients in Canadian acute care facilities, 1995-2007. Pediatr Infect Dis J. 2012 Aug. 31(8):814-20. [Medline]. Alesana-Slater J, Ritchie SR, Heffernan H, Camp T, Richardson A, Herbison P. Methicillin-resistant Staphylococcus aureus, Samoa, 2007-2008. Emerg Infect Dis. 2011 Jun. 17(6):1023-9. [Medline]. Suzuki M, Yamada K, Nagao M, Aoki E, Matsumoto M, Hirayama T, et al. Antimicrobial Ointments and Methicillin-Resistant Staphylococcus aureus USA300. Emerg Infect Dis. 2011 Oct. 17(10):1917-20. [Medline]. Tong SY, Bishop EJ, Lilliebridge RA, et al. Community-associated strains of methicillin-resistant Staphylococcus aureus and methicillin-susceptible S. aureus in indigenous Northern Australia: epidemiology and outcomes. J Infect Dis. 2009 May 15. 199(10):1461-70. [Medline]. Salmenlinna S, Lyytikainen O, Vainio A, Myllyniemi AL, Raulo S, Kanerva M, et al. Human Cases of Methicillin-Resistant Staphylococcus aureus CC398, Finland. Emerg Infect Dis. 2010 Oct. 16(10):1626-9. [Medline]. Tappe D, Schulze MH, Oesterlein A, Turnwald D, Müller A, Vogel U, et al. Panton-Valentine leukocidin-positive Staphylococcus aureus infections in returning travelers. Am J Trop Med Hyg. 2010 Oct. 83(4):748-50. [Medline]. [Full Text]. Chua K, Laurent F, Coombs G, Grayson ML, Howden BP. Not Community-Associated Methicillin-Resistant Staphylococcus aureus (CA-MRSA)! A Clinician's Guide to Community MRSA - Its Evolving Antimicrobial Resistance and Implications for Therapy. Clin Infect Dis. 2011 Jan. 52(1):99-114. [Medline]. Nickerson EK, Wuthiekanun V, Kumar V, Amornchai P, Wongdeethai N, Chheng K. Emergence of Community-Associated Methicillin-Resistant Staphylococcus aureus Carriage in Children in Cambodia. Am J Trop Med Hyg. 2011 Feb. 84(2):313-7. [Medline]. Hamdan-Partida A, Sainz-Espuñes T, Bustos-Martínez J. Characterization and persistence of Staphylococcus aureus strains isolated from the anterior nares and throats of healthy carriers in a Mexican community. J Clin Microbiol. 2010 May. 48(5):1701-5. [Medline]. Muttaiyah S, Coombs G, Pandey S, Reed P, Ritchie S, Lennon D, et al. Incidence, risk factors, and outcomes of Panton-Valentine leukocidin-positive methicillin-susceptible Staphylococcus aureus infections in Auckland, New Zealand. J Clin Microbiol. 2010 Oct. 48(10):3470-4. [Medline]. [Full Text]. Adler A, Givon-Lavi N, Moses AE, Block C, Dagan R. Carriage of community-associated methicillin-resistant Staphylococcus aureus in a cohort of infants in southern Israel: risk factors and molecular features. J Clin Microbiol. 2010 Feb. 48(2):531-8. [Medline]. [Full Text]. Vaska VL, Grimwood K, Gole GA, Nimmo GR, Paterson DL, Nissen MD. Community-associated Methicillin-resistant Staphylococcus aureus Causing Orbital Cellulitis in Australian Children. Pediatr Infect Dis J. 2011 Nov. 30(11):1003-1006. [Medline]. Marra F, Patrick DM, Chong M, McKay R, Hoang L, Bowie WR. Population-based study of the increased incidence of skin and soft tissue infections and associated antimicrobial use. Antimicrob Agents Chemother. 2012 Dec. 56(12):6243-9. [Medline]. [Full Text]. Jenkins TC, Sabel AL, Sarcone EE, Price CS, Mehler PS, Burman WJ. Skin and soft-tissue infections requiring hospitalization at an academic medical center: opportunities for antimicrobial stewardship. Clin Infect Dis. 2010 Oct 15. 51(8):895-903. [Medline]. Spellberg B. Skin and soft-tissue infections: modern evolution of an ancient problem. Clin Infect Dis. 2010 Oct 15. 51(8):904-6. [Medline]. [Full Text]. Carrillo-Marquez MA, Hulten KG, Hammerman W, Lamberth L, Mason EO, Kaplan SL. Staphylococcus aureus Pneumonia in Children in the Era of Community-acquired Methicillin-resistance at Texas Children's Hospital. Pediatr Infect Dis J. 2011 Jul. 30(7):545-50. [Medline]. Vander Have KL, Karmazyn B, Verma M, Caird MS, Hensinger RN, Farley FA. Community-associated methicillin-resistant Staphylococcus aureus in acute musculoskeletal infection in children: a game changer. J Pediatr Orthop. 2009 Dec. 29(8):927-31. [Medline]. Fretzayas A, Moustaki M, Tsagris V, Brozou T, Nicolaidou P. MRSA blistering distal dactylitis and review of reported cases. Pediatr Dermatol. 2011 Jul-Aug. 28(4):433-5. [Medline]. Carrillo-Marquez MA, Hulten KG, Hammerman W, Mason EO, Kaplan SL. USA300 is the predominant genotype causing Staphylococcus aureus septic arthritis in children. Pediatr Infect Dis J. 2009 Dec. 28(12):1076-80. [Medline]. Carrillo-Marquez MA, Hulten KG, Mason EO, Kaplan SL. Clinical and Molecular Epidemiology of Staphylococcus aureus Catheter-Related Bacteremia in Children. Pediatr Infect Dis J. 2010 May. 29(5):410-4. [Medline]. Jacobson JA, Kasworm E, Daly JA. Risk of developing toxic shock syndrome associated with toxic shock syndrome toxin 1 following nongenital staphylococcal infection. Rev Infect Dis. 1989 Jan-Feb. 11 Suppl 1:S8-13. [Medline]. John CC, Niermann M, Sharon B, Peterson ML, Kranz DM, Schlievert PM. Staphylococcal toxic shock syndrome erythroderma is associated with superantigenicity and hypersensitivity. Clin Infect Dis. 2009 Dec 15. 49(12):1893-6. [Medline]. [Full Text]. Ramirez-Schrempp D, Dorfman DH, Baker WE, Liteplo AS. Ultrasound soft-tissue applications in the pediatric emergency department: to drain or not to drain?. Pediatr Emerg Care. 2009 Jan. 25(1):44-8. [Medline]. Sivitz AB, Lam SH, Ramirez-Schrempp D, Valente JH, Nagdev AD. Effect of bedside ultrasound on management of pediatric soft-tissue infection. J Emerg Med. 2010 Nov. 39(5):637-43. [Medline]. Corey GR. Staphylococcus aureus bacteremia and endocarditis: the role of diagnostic evaluation. Infect Dis Clin Pract. 2011/09. 19(5):307-312. Kaasch AJ, Fowler VG Jr, Rieg S, Peyerl-Hoffmann G, Birkholz H, Hellmich M, et al. Use of a simple criteria set for guiding echocardiography in nosocomial Staphylococcus aureus bacteremia. Clin Infect Dis. 2011 Jul 1. 53(1):1-9. [Medline]. [Full Text]. Soriano A, Mensa J. Is transesophageal echocardiography dispensable in hospital-acquired Staphylococcus aureus bacteremia?. Clin Infect Dis. 2011 Jul 1. 53(1):10-2. [Medline]. Showler A, Burry L, Bai AD, Steinberg M, Ricciuto DR, Fernandes T, et al. Use of Transthoracic Echocardiography in the Management of Low-Risk Staphylococcus aureus Bacteremia: Results From a Retrospective Multicenter Cohort Study. JACC Cardiovasc Imaging. 2015 Jul 8. [Medline]. Boggs W. Transthoracic Echocardiography Adequate for Ruling Out Infective Endocarditis. http://www.medscape.com/viewarticle/848780. Available at http://www.medscape.com/viewarticle/848780. July 30, 2015; Accessed: August 7, 2015. Patel Wylie F, Kaplan SL, Mason EO, Allen CH. Needle aspiration for the etiologic diagnosis of children with cellulitis in the era of community-acquired methicillin-resistant Staphylococcus aureus. Clin Pediatr (Phila). 2011 Jun. 50(6):503-7. [Medline]. Duong M, Markwell S, Peter J, Barenkamp S. Randomized, controlled trial of antibiotics in the management of community-acquired skin abscesses in the pediatric patient. Ann Emerg Med. 2010 May. 55(5):401-7. [Medline]. Lee MC, Rios AM, Aten MF, Mejias A, Cavuoti D, McCracken GH Jr, et al. Management and outcome of children with skin and soft tissue abscesses caused by community-acquired methicillin-resistant Staphylococcus aureus. Pediatr Infect Dis J. 2004 Feb. 23(2):123-7. [Medline]. Rajendran PM, Young D, Maurer T, Chambers H, Perdreau-Remington F, Ro P. Randomized, double-blind, placebo-controlled trial of cephalexin for treatment of uncomplicated skin abscesses in a population at risk for community-acquired methicillin-resistant Staphylococcus aureus infection. Antimicrob Agents Chemother. 2007 Nov. 51(11):4044-8. [Medline]. Ruhe JJ, Smith N, Bradsher RW, Menon A. Community-onset methicillin-resistant Staphylococcus aureus skin and soft-tissue infections: impact of antimicrobial therapy on outcome. Clin Infect Dis. 2007 Mar 15. 44(6):777-84. [Medline]. Karchmer AW. Staphylococcus aureus bacteremia and native valve endocarditis: the role of antimicrobial therapy. Infect Dis Clin Pract. March 2012. 20(2):100-108. Chen AE, Carroll KC, Diener-West M, Ross T, Ordun J, Goldstein MA, et al. Randomized controlled trial of cephalexin versus clindamycin for uncomplicated pediatric skin infections. Pediatrics. 2011 Mar. 127(3):e573-80. [Medline]. McNamara WF, Hartin CW Jr, Escobar MA, Yamout SZ, Lau ST, Lee YH. An alternative to open incision and drainage for community-acquired soft tissue abscesses in children. J Pediatr Surg. 2011 Mar. 46(3):502-6. [Medline]. Keller DM. Staph aureus Scheme Cuts Surgical Infection. Medscape Medical News. Available at http://www.medscape.com/viewarticle/833457. Accessed: October 19, 2014. Schweizer M, et al. A multicenter intervention to reduce surgical site infections among patients undergoing cardiac operations and total joint arthroplasty (STOP SSI STUDY). Paper presented at IDWeek; October 8-12, 2014; Philadelphia, PA. [Full Text]. Smit J, López-Cortés LE, Thomsen RW, Schønheyder HC, Nielsen H, Frøslev T, et al. Statin Use and Risk of Community-Acquired Staphylococcus aureus Bacteremia: A Population-Based Case-Control Study. Mayo Clin Proc. 2017 Oct. 92 (10):1469-1478. [Medline]. Brooks M. Statins May Help Guard Against S aureus Bacteremia. Medscape News. Available at https://www.medscape.com/viewarticle/887676#vp_1. October 26, 2017; Accessed: November 1, 2017. Nailor MD, Sobel JD. Antibiotics for gram-positive bacterial infections: vancomycin, teicoplanin, quinupristin/dalfopristin, oxazolidinones, daptomycin, dalbavancin, and telavancin. Infect Dis Clin N Am. Dec 2009. 23(4):965-82. Thwaites GE, Edgeworth JD, Gkrania-Klotsas E, Kirby A, Tilley R, Török ME. Clinical management of Staphylococcus aureus bacteraemia. Lancet Infect Dis. 2011 Mar. 11(3):208-222. [Medline]. Weisman LE, Thackray HM, Steinhorn RH, Walsh WF, Lassiter HA, Dhanireddy R, et al. A randomized study of a monoclonal antibody (pagibaximab) to prevent staphylococcal sepsis. Pediatrics. 2011 Aug. 128(2):271-9. [Medline]. Jimenez-Truque N, Thomsen I, Saye E, Creech CB. Should higher vancomycin trough levels be targeted for invasive community-acquired methicillin-resistant Staphylococcus aureus infections in children?. Pediatr Infect Dis J. 2010 Apr. 29(4):368-70. [Medline]. Aguado JM, San-Juan R, Lalueza A, Sanz F, Rodríguez-Otero J, Gómez-Gonzalez C, et al. High Vancomycin MIC and Complicated Methicillin-Susceptible Staphylococcus aureus Bacteremia. Emerg Infect Dis. 2011 Jun. 17(6):1099-102. [Medline]. Lubin AS, Snydman DR, Ruthazer R, Bide P, Golan Y. Predicting high vancomycin minimum inhibitory concentration in methicillin-resistant Staphylococcus aureus bloodstream infections. Clin Infect Dis. 2011 Apr 15. 52(8):997-1002. [Medline]. Kullar R, Davis SL, Levine DP, Rybak MJ. Impact of vancomycin exposure on outcomes in patients with methicillin-resistant Staphylococcus aureus bacteremia: support for consensus guidelines suggested targets. Clin Infect Dis. 2011 Apr 15. 52(8):975-81. [Medline]. Patel N, Pai MP, Rodvold KA, Lomaestro B, Drusano GL, Lodise TP. Vancomycin: we can't get there from here. Clin Infect Dis. 2011 Apr 15. 52(8):969-74. [Medline]. van Hal SJ, Lodise TP, Paterson DL. The Clinical Significance of Vancomycin Minimum Inhibitory Concentration in Staphylococcus aureus Infections: A Systematic Review and Meta-analysis. Clin Infect Dis. 2012 Mar. 54(6):755-71. [Medline]. Deresinski S. Methicillin-Resistant Staphylococcus aureus and Vancomycin: Minimum Inhibitory Concentration Matters. Clin Infect Dis. 2012 Mar. 54(6):772-4. [Medline]. Wunderink RG, Niederman MS, Kollef MH, Shorr AF, Kunkel MJ, Baruch A, et al. Linezolid in Methicillin-Resistant Staphylococcus aureus Nosocomial Pneumonia: A Randomized, Controlled Study. Clin Infect Dis. 2012 Mar. 54(5):621-9. [Medline]. Ramirez P, Fernández-Barat L, Torres A. New therapy options for MRSA with respiratory infection/pneumonia. Curr Opin Infect Dis. 2012 Apr. 25(2):159-65. [Medline]. Morales G, Picazo JJ, Baos E, Candel FJ, Arribi A, Pelaez B. Resistance to linezolid is mediated by the cfr gene in the first report of an outbreak of linezolid-resistant Staphylococcus aureus. Clin Infect Dis. 2010 Mar 15. 50(6):821-5. [Medline]. Sanchez Garcia M, De la Torre MA, Morales G, et al. Clinical outbreak of linezolid-resistant Staphylococcus aureus in an intensive care unit. JAMA. 2010 Jun 9. 303(22):2260-4. [Medline]. Prokocimer P, De Anda C, Fang E, Mehra P, Das A. Tedizolid phosphate vs linezolid for treatment of acute bacterial skin and skin structure infections: the ESTABLISH-1 randomized trial. JAMA. 2013 Feb 13. 309(6):559-69. [Medline]. Prokocimer P, Bien P, Deanda C, Pillar CM, Bartizal K. In vitro activity and microbiological efficacy of tedizolid (TR-700) against Gram-positive clinical isolates from a phase 2 study of oral tedizolid phosphate (TR-701) in patients with complicated skin and skin structure infections. Antimicrob Agents Chemother. 2012 Sep. 56(9):4608-13. [Medline]. [Full Text]. Moran GJ, Fang E, Corey GR, Das AF, De Anda C, Prokocimer P. Tedizolid for 6 days versus linezolid for 10 days for acute bacterial skin and skin-structure infections (ESTABLISH-2): a randomised, double-blind, phase 3, non-inferiority trial. Lancet Infect Dis. 2014 Jun 5. [Medline]. Lowes, R. New Antibiotic Tedizolid (Sivextro) Approved by FDA. Medscape Medical News. Available at http://www.medscape.com/viewarticle/827168. Accessed: June 26, 2014. Saravolatz LD, Stein GE, Johnson LB. Telavancin: a novel lipoglycopeptide. Clin Infect Dis. 2009 Dec 15. 49(12):1908-14. [Medline]. Brooks M. FDA OKs Oritavancin (Orbactiv) for Skin Infections. Medscape Medical News. Aug 7 2014. [Full Text]. Moellering RC, Jr, Ferraro MJ. Oritavancin for the treatment of serious gram-positive infections. Clin Infect Dis. 15 April 2012. 54(Suppl 3):S201-S243. Corey GR, Wilcox M, Talbot GH, et al. Integrated analysis of CANVAS 1 and 2: phase 3, multicenter, randomized, double-blind studies to evaluate the safety and efficacy of ceftaroline versus vancomycin plus aztreonam in complicated skin and skin-structure infection. Clin Infect Dis. 2010 Sep 15. 51(6):641-50. [Medline]. Saravolatz LD, Stein GE, Johnson LB. Ceftaroline: a novel cephalosporin with activity against methicillin-resistant Staphylococcus aureus. Clin Infect Dis. 2011 May. 52(9):1156-63. [Medline]. Gums JG. Ceftaroline fosamil: a broad-spectrum cephalosporin with methicillin-resistant Staphylococcus aureus activity. Infect Dis Clin Pract. March 2012. 20(2):122-130. Farrell DJ, Castanheira M, Mendes RE, Sader HS, Jones RN. In vitro activity of ceftaroline against multidrug-resistant Staphylococcus aureus and Streptococcus pneumoniae: a review of published studies and the AWARE Surveillance Program (2008-2010). Clin Infect Dis. 2012 Sep. 55 Suppl 3:S206-14. [Medline]. Sader HS, Flamm RK, Farrell DJ, Jones RN. Activity analyses of staphylococcal isolates from pediatric, adult, and elderly patients: AWARE Ceftaroline Surveillance Program. Clin Infect Dis. 2012 Sep. 55 Suppl 3:S181-6. [Medline]. Jones RN, Mendes RE, Sader HS, Castanheira M. In vitro antimicrobial findings for fusidic acid tested against contemporary (2008-2009) gram-positive organisms collected in the United States. Clin Infect Dis. 2011 Jun. 52 Suppl 7:S477-86. [Medline]. Craft JC, Moriarty SR, Clark K, Scott D, Degenhardt TP, Still JG. A randomized, double-blind phase 2 study comparing the efficacy and safety of an oral fusidic acid loading-dose regimen to oral linezolid for the treatment of acute bacterial skin and skin structure infections. Clin Infect Dis. 2011 Jun. 52 Suppl 7:S520-6. [Medline]. Fernandes P, Pereira D. Efforts to support the development of fusidic acid in the United States. Clin Infect Dis. 2011 Jun. 52 Suppl 7:S542-6. [Medline]. Lee AS, Macedo-Vinas M, François P, Renzi G, Schrenzel J, Vernaz N. Impact of combined low-level mupirocin and genotypic chlorhexidine resistance on persistent methicillin-resistant Staphylococcus aureus carriage after decolonization therapy: a case-control study. Clin Infect Dis. 2011 Jun 15. 52(12):1422-30. [Medline]. Jain R, Kralovic SM, Evans ME, et al. Veterans Affairs initiative to prevent methicillin-resistant Staphylococcus aureus infections. N Engl J Med. 2011 Apr 14. 364(15):1419-30. [Medline]. Robotham JV, Graves N, Cookson BD, Barnett AG, Wilson JA, Edgeworth JD. Screening, isolation, and decolonisation strategies in the control of meticillin resistant Staphylococcus aureus in intensive care units: cost effectiveness evaluation. BMJ. 2011. 343:d5694. [Medline]. Simor AE. Staphylococcal decolonisation: an effective strategy for prevention of infection?. Lancet Infect Dis. 2011 Dec. 11(12):952-62. [Medline]. Fritz SA, Hogan PG, Hayek G, Eisenstein KA, Rodriguez M, Epplin EK, et al. Household Versus Individual Approaches to Eradication of Community-Associated Staphylococcus aureus in Children: A Randomized Trial. Clin Infect Dis. 2012 Mar. 54(6):743-51. [Medline]. [Full Text]. Miller LG. Where We Are With Community-Associated Staphylococcus aureus Prevention--And in the Meantime, What Do We Tell Our Patients?. Clin Infect Dis. 2012 Mar. 54(6):752-4. [Medline]. Kling J. PCR screening cuts in-hospital infection. Medscape Medical News. May 14, 2013. [Full Text]. Milstone AM, Goldner BW, Ross T, Shepard JW, Carroll KC, Perl TM. Methicillin-resistant Staphylococcus aureus colonization and risk of subsequent infection in critically ill children: importance of preventing nosocomial methicillin-resistant Staphylococcus aureus transmission. Clin Infect Dis. 2011 Nov. 53(9):853-9. [Medline]. [Full Text]. Huang SS, Septimus E, Kleinman K, Moody J, Hickok J, Avery TR, et al. Targeted versus Universal Decolonization to Prevent ICU Infection. N Engl J Med. 2013 May 29. [Medline]. Edmond MB, Wenzel RP. Screening Inpatients for MRSA - Case Closed. N Engl J Med. 2013 May 29. [Medline]. Laidman J. MRSA: Universal Decolonization Beats Screening and Isolation. Medscape Medical News. Available at http://www.medscape.com/viewarticle/805005. Accessed: June 11, 2013. Shenoy ES, Kim J, Rosenberg ES, Cotter JA, Lee H, Walensky RP, et al. Discontinuation of Contact Precautions for Methicillin-Resistant Staphylococcus aureus: A Randomized Controlled Trial Comparing Passive and Active Screening With Culture and Polymerase Chain Reaction. Clin Infect Dis. 2013 Jul. 57(2):176-84. [Medline]. [Full Text]. Lin Y-C, Peterson ML. New insights into the prevention of staphylococcal infections and toxic shock syndrome. Expert Rev Clin Pharmacol. 2010. 3:753-767. Huda T, Nair H, Theodoratou E, Zgaga L, Fattom A, El Arifeen S, et al. An evaluation of the emerging vaccines and immunotherapy against staphylococcal pneumonia in children. BMC Public Health. 2011 Apr 13. 11 Suppl 3:S27. [Medline]. [Full Text]. Daum RS, Spellberg B. Progress Toward a Staphylococcus aureus Vaccine. Clin Infect Dis. 2012 Feb. 54(4):560-7. [Medline]. Theilacker C, Kropec A, Hammer F, Sava I, Wobser D, Sakinc T. Protection Against Staphylococcus aureus by Antibody to the Polyglycerolphosphate Backbone of Heterologous Lipoteichoic Acid. J Infect Dis. 2012 Apr. 205(7):1076-85. [Medline]. Proctor RA. Challenges for a Universal Staphylococcus aureus Vaccine. Clin Infect Dis. 2012 Apr. 54(8):1179-86. [Medline]. Anderson AS, Scully IL, Timofeyeva Y, Murphy E, McNeil LK, Mininni T, et al. Staphylococcus aureus Manganese Transport Protein C Is a Highly Conserved Cell Surface Protein That Elicits Protective Immunity Against S. aureus and Staphylococcus epidermidis. J Infect Dis. 2012 Jun. 205(11):1688-96. [Medline]. [Full Text]. Fritz SA, Tiemann KM, Hogan PG, Epplin EK, Rodriguez M, Al-Zubeidi DN, et al. A Serologic Correlate of Protective Immunity Against Community-Onset Staphylococcus aureus Infection. Clin Infect Dis. 2013 Jun. 56(11):1554-61. [Medline]. [Full Text]. McNeil JC, Hulten KG, Kaplan SL, Mahoney DH, Mason EO. Staphylococcus aureus Infections in Pediatric Oncology Patients: High Rates of Antimicrobial Resistance, Antiseptic Tolerance and Complications. Pediatr Infect Dis J. 2013 Feb. 32(2):124-8. [Medline]. Creel AM, Durham SH, Benner KW, Alten JA, Winkler MK. Severe invasive community-associated methicillin-resistant Staphylococcus aureus infections in previously healthy children. Pediatr Crit Care Med. 2009 May. 10(3):323-7. [Medline]. Vergnano S, Menson E, Smith Z, Kennea N, Embleton N, Clarke P. Characteristics of Invasive Staphylococcus aureus in United Kingdom Neonatal Units. Pediatr Infect Dis J. 2011 Oct. 30(10):850-4. [Medline]. Menif K, Bouziri A, Khaldi A, Hamdi A, Belhadj S, Borgi A, et al. Community-associated methicillin-resistant Staphylococcus aureus infections in a pediatric intensive care unit. J Infect Dev Ctries. 2011 Aug 12. 5(8):587-91. [Medline]. Heinrich N, Mueller A, Bartmann P, Simon A, Bierbaum G, Engelhart S. Successful management of an MRSA outbreak in a neonatal intensive care unit. Eur J Clin Microbiol Infect Dis. 2011 Jul. 30(7):909-13. [Medline]. Woodlief RS, Markowitz JE. Unrecognized invasive infection in a neonate colonized with methicillin-resistant staphylococcus aureus. J Pediatr. 2009 Dec. 155(6):943-943.e1. [Medline]. Arora P, Kalra VK, Pappas A. Multiple brain abscesses in a neonate after blood stream infection with methicillin-resistant Staphylococcus aureus. J Pediatr. 2012 Sep. 161(3):563-563.e1. [Medline]. Niemann S, Ehrhardt C, Medina E, Warnking K, Tuchscherr L, Heitmann V, et al. Combined action of influenza virus and Staphylococcus aureus panton-valentine leukocidin provokes severe lung epithelium damage. J Infect Dis. 2012 Oct 1. 206(7):1138-48. [Medline]. [Full Text]. Faden H, Gill S, Lesse A. Impact of Management and Bacterial Genomics on Outcomes of Staphylococcus aureus Bacteremia in Children. Clin Pediatr (Phila). 2011 Jun 17. [Medline]. Mejer N, Westh H, Schønheyder HC, Jensen AG, Larsen AR, Skov R, et al. Stable incidence and continued improvement in short term mortality of Staphylococcus aureus bacteraemia between 1995 and 2008. BMC Infect Dis. 2012 Oct 17. 12:260. [Medline]. [Full Text]. Sengupta A, Rand C, Perl TM, Milstone AM. Knowledge, Awareness, and Attitudes Regarding Methicillin-Resistant Staphylococcus Aureus among Caregivers of Hospitalized Children. J Pediatr. 2011 Mar. 158(3):416-21. [Medline]. Thwaites GE, Scarborough M, Szubert A,. Adjunctive rifampicin for Staphylococcus aureus bacteraemia (ARREST): a multicentre, randomised, double-blind, placebo-controlled trial. Lancet. 2018 Feb 17. 391 (10121):668-678. [Medline]. Lateral chest radiograph of a 15-year-old with staphylococcal endocarditis and multiple septic emboli, revealing borderline cardiomegaly, multiple nodular infiltrates, and bilateral pleural effusions. CT scan of the thorax (mediastinal windows) of a 15-year-old with staphylococcal endocarditis and multiple septic emboli, revealing bilateral pleural effusions. CT scan of the thorax (lung windows) of a 15-year-old with staphylococcal endocarditis and multiple septic emboli, demonstrating multiple nodular infiltrates (some with cavitation) consistent with septic emboli, volume loss on the right, and pleural effusions. CT scan of the thorax (lung windows) of a 15-year-old with staphylococcal endocarditis and multiple septic emboli, revealing multiple nodular infiltrates (some with cavitation) consistent with septic emboli, volume loss on the right, and pleural effusions. Follow-up CT scan of the thorax (lung windows) of a 15-year-old with staphylococcal endocarditis and multiple septic emboli, revealing multiple nodular infiltrates (some with cavitation) consistent with septic emboli, volume loss on the right, and pleural effusions. Follow-up CT scan of the thorax (lung windows) of a 15-year-old with staphylococcal endocarditis and multiple septic emboli, revealing multiple nodular infiltrates (some with cavitation) consistent with septic emboli and evolution of the lesions over time.